At around 5:45am, I woke up with start, thinking that I had slept past my morning-alarm. It was a silent, misty and cool morning, one of numerous Jibhi must be used to. The river’s was the only noise you could hear in the otherwise silent morning. I got out of my bed and walked outside to see if everybody was ready. No one was ready, nor was anyone in sight. I went back to the room and saw that there still were 10 minutes to go for the alarm to ring. Was it 7:00am or was it 8:00am that we were expected to be ready at? My mind was playing tricks. Or maybe it was the hangover. While trying to focus on the conversation regarding the time, my gaze drifted to my bed-side table. The camera batteries were encased in the charging unit and it was plugged in, but I had forgotten to turn the switch on. Either I was too tired or too drunk the night before, or maybe both. I turned the switch on for whatever time was left and shifted the alarm by an hour and slept some more. At 7:00am, I got up completely refreshed, ready to take on the world. There was no trace of hangover or tiredness. In another 45 minutes, I was ready with self and luggage, and joined everyone else in the dining area at 8:00 am. While having breakfast, I casually wondered aloud that why weren’t we leaving yet. Mr. Urrack replied that we were waiting for the drizzle to stop. And that was when I looked outside carefully. It WAS drizzling and all that noise wasn’t from the river alone. The walk from my room to the dining area was a good distance underneath the open sky, and I have no idea how i missed the fact that it was drizzling. Very light drizzle, but it was there. And this is how I typically am. I observe what no one does, and miss the things that even a blind man would notice. I had my amazing ‘masala chai’ and bread omelette, while others had fruits and cornflakes etc. We left the homestay at around 9:00am. While on the way up, we came across mud track that had gone all slushy because of the drizzle. 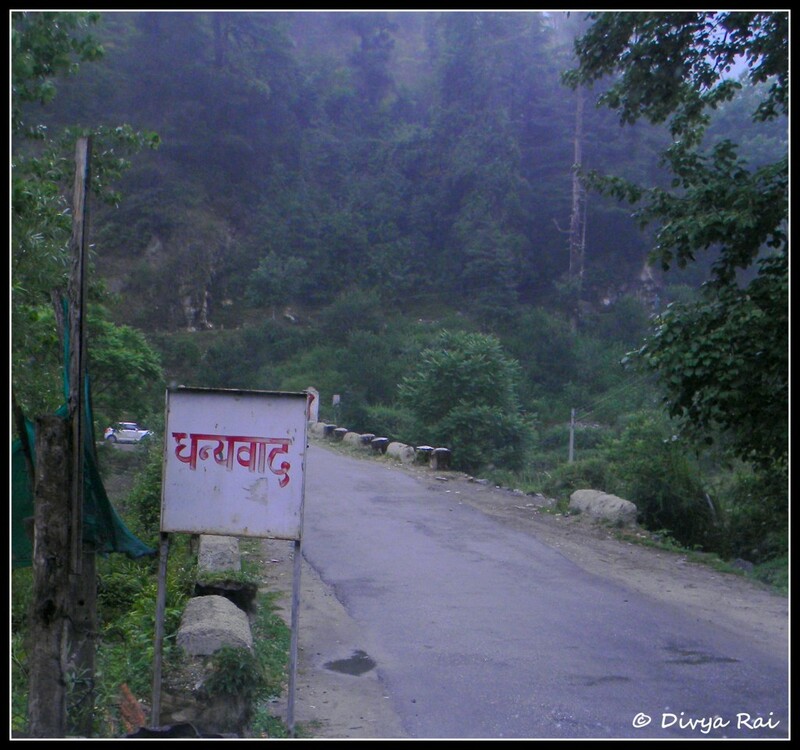 Also, the road to Jalori pass was so narrow at places that only one vehicle could pass at a time. One side was the mountain and the other had the gorge. The terrain seemed so risky at places that I wondered if I had taken the entire thing a bit too lightly. Here, you had a very small margin of error. And at some places, it was negligible. It was clear that you would pay with your life in case you or your cycle erred. Downhill cycling is totally dependent on brakes. If you fail to brake, or if the brakes fail you for some reason of their own, you go down the valley, into the several hundred feet of nothingness. We reached Jalori pass by 9:30am to a line-up of MTBs of various makes. After 20 minutes, we were all ready to roll. We started in groups as the track did not have room for a big bunch of cyclists. Max-to-max it could be two people, one slightly ahead of the other. Not side by side. Jogi, the guy who had arranged the cycling expedition, was the cover for the entire group. He was a professional when it came to mountain biking. Three of us decided to be just ahead of Jogi. It surprised us much that Jogi regularly held cycling expeditions in Leh and Ladakh. 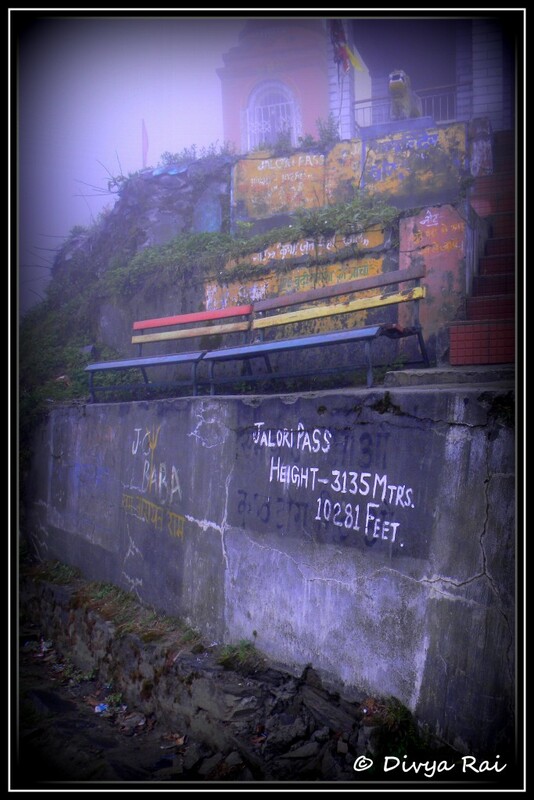 The total distance from Jalori Pass to Banjar market was 23 kms. Of which, 11 kms was just mud-track. Honestly, if you ask me, it was better to ride on than the road. Also, at places the track got very narrow, and one would stop on the outer side (close to the gorge) and let the oncoming vehicle pass before resuming the ride. I wondered if cycle was such a problem, how the bus drivers were driving without as much slowing the speed even! Jogi told me that they were fairly used to this terrain and most probably, were locals. They knew it like the back of their hand. Once the mud patch got over and the metalled road began, the initial 3 kms was an ordeal in itself. There were more pot-holes than the road. And it was still very steep at places. At one such point, we were going down on a steep patch of land. I had got a good grip on the entire thing by now and was cruising at a good speed. Suddenly, just 50 meters before a hair pin turn, I felt that I was going at much higher a speed than I could manage. Andrew, who was just ahead of me, had to cut to his left to let me pass by. But even as he did so, I tried applying the back brakes so as to lower the speed. Thrice I tried, but it was not meant to be and Andrew cut to his left just in time. As he did so, I had to apply my front brakes in isolation (this is one grave mistake when it comes to mountain biking, but this was my last resort). It resulted in the cycle tumbling twice over, but thankfully staying on the track. The gorge was just two meters from where I was sprawled. Andrew and Jogi quickly did the necessary first aid; Andrew did mine while Jogi did the cycle’s. According to Jogi, the brakes hadn’t failed, but were too tight. How come? After 13kms of cycling? No idea. I luckily got away with a minor bruise on my palm. Andrew and I exchanged cycles as I was feeling unsure of mine. The one I got from Andrew after exchanging was Firefox Target. Its shock-absorbing quality was not as good as the TREK model I was riding, but Jogi told me I was comparing two different brackets of products. The only problem that I now faced was – holding the brakes. 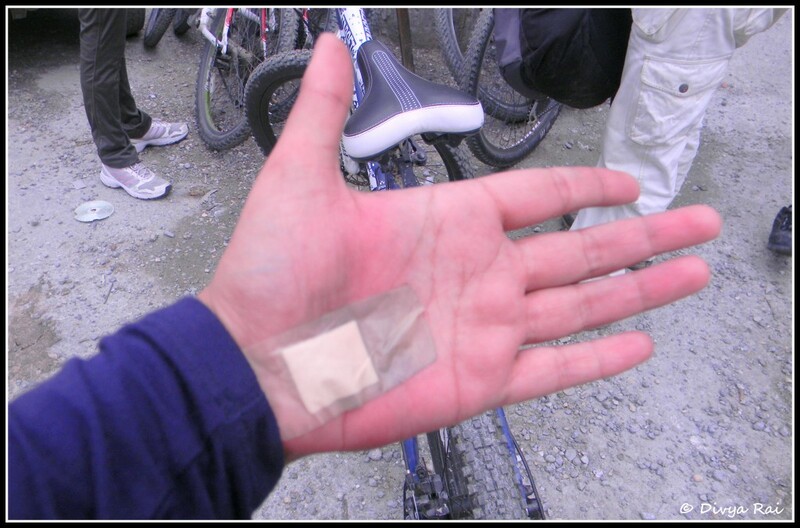 Since the palm was where I had hurt myself, and it was involved in holding the brakes, it pained like hell. Bruises have a tendency and capacity to hurt much more than bigger injuries. At least at times they do.I decided to go slow, at my own pace. There was a stop-over after 15kms or so, alongside a stream. We stopped for rest and customary “dipping the head in water” and a few group clicks. The last 4 kilometer before the Banjar market was the best stretch on the entire terrain! It totally fed the soul! Steep and good road for downhill cycling. I wanted to go easy on the brakes like a few others, but with pain in one arm, it just wasn’t possible. We reached where the Banjar market started and waited for the rest of the group to join us. And then we all moved to the parking lot where our bus was parked with our luggage. Two people from our group had a flight early next morning and hence they took a taxi to Delhi from Banjar market. The rest of us started the journey back home soon after. It was already 1:30 pm. Somewhere around Mandi, we saw an accident that most of us are going to remember for a long time to come. Two cars, trying to speed past each other and overtake on a bend of road resulted in one of them going down the valley. The remarkable fact was that one had a Haryana licence plate and the other had a Punjab one. Therefore, the driving style was same as that of plains; hurried. The hills need patience. We quickly stopped and so did many other vehicles. Some of us went down the valley to rescue the people from the car. The car was stuck amongst the trees and that is what saved it from going further down. Two kids had minor injuries but were quite shaken up. The father, who was driving was fairly ok. The two ladies in the care had had multiple internal injuries and were wailing and crying even at slightest touch. We did the necessary first aid on the girls as their injuries were superficial. A few cars volunteered to take the women to the hospital and the police and the rescue team was alerted. We resumed our journey from there, this time a bit more careful. We crossed Chandigarh at around midnight and took a stopover at Punjab-Haryana border at about 2:30 am. Some of us had dinner and once the journey resumed, slept like a log. We got up only when we hit the final destination at South Extension in Delhi. It was 7:00 am and we had made well in time. We were back to the hum-drum called ‘life’.